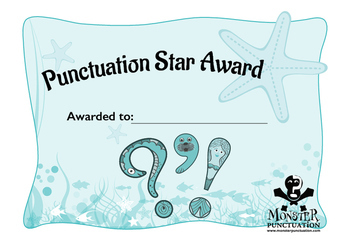 Reward the writing stars in your class with this funky certificate! Part of the Unpunctuated series of writing and punctuation resources that aim to help children make sense of punctuation by understanding them as writer’s tools. Students can develop their writing skills by playing with written language including the Unpunctuated Challenge Sheets and the series of editable powerpoints that introduce punctuation progressively with simple to understand explanations. The series uses a theme of ‘Mermaids & Water Monsters’ to stimulate the imagination and support teachers to keep the creativity in teaching spelling grammar..